We take a tour of the Layers panel in the Contents pane, learning how to manage layer display order, select layers, turn several layers on and off at the same time, alter opacity settings for one or more layers and how to change background color. 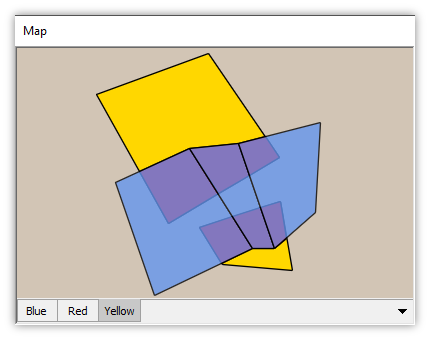 Consider the map above, which has six layers, two of which are turned on for display. With the focus on the map, we click the Contents pane or, if the Contents pane is not open we choose View - Panes - Contents to open it. If the Layers panel is not already in action we click on the active panel's title bar and choose Layers from the pull down men. The Layers panel shows the six layers in the map plus a virtual "layer," the background color used for the map window. 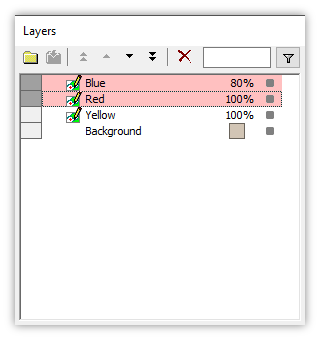 Empty boxes at the right margin indicate layers that are turned off. 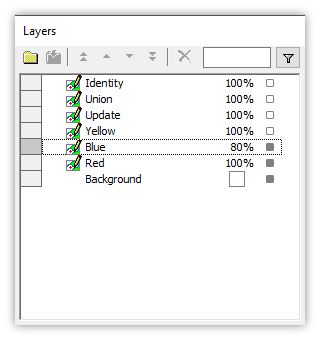 Filled boxes indicate layers that are turned on for display. 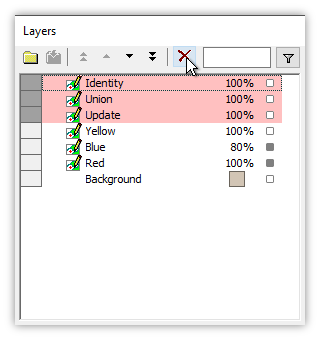 We can toggle a layer's display status by double-clicking on the name of the layer or on the on/off box. Above, we have just double-clicked on the Red layer to turn it on for display. The Red layer immediately appears in the map. We can double-click the Yellow layer to turn it off. The Yellow layer immediately disappears from the map. 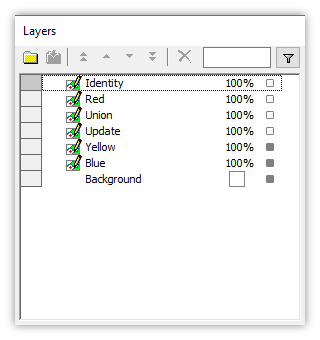 Note that the map's layer tab indicates it is still the active layer, but it is now turned off for display. 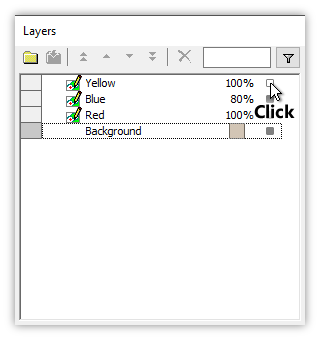 To select a layer we Ctrl-click anywhere in the layer's row. We Ctrl-click on the Red layer to select it. 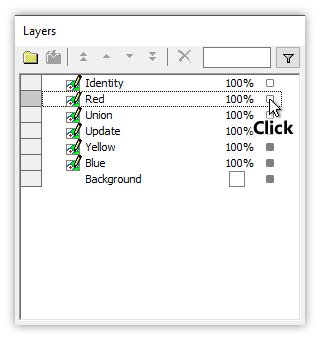 Ctrl-clicking on a layer will toggle it to selected or not selected. When one or more layers is selected, the toolbar icons will be enabled. Use these to move the selected layer to the top of the stack, up one level, down one level, to the bottom of the stack or to delete the layer from the window. 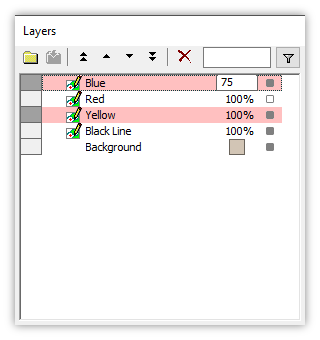 Commands on the toolbar will apply to all selected layers. Important: The Delete button in the Layers pane toolbar does not delete the component from the project. It simply removes it from appearing in the window. We Click the Move to Bottom button. That moves the selected Red layer to the bottom of the display stack, just above the Background (which always comes last). The result in the map is that we can no longer see the Red objects, because they are covered by the 100% opaque objects in the Blue layer. We can double-click into the opacity setting of the Blue layer and change it to 80 (no need to enter the % character) to make the Blue layer partially transparent. The result of applying 80% opacity to the Blue layer is to allow the Red layer to partially show through the Blue layer, as if the Blue layer objects were made of blue plastic that was about 20% transparent. To change the background color we double-click into the Background color well. In the illustration above we have changed the color to a light brown color. The background in the window immediately changes from white color to the color we have specified. This alters the appearance of the partially transparent Blue layer objects because now their blue color is combined with the light brown color of the background. 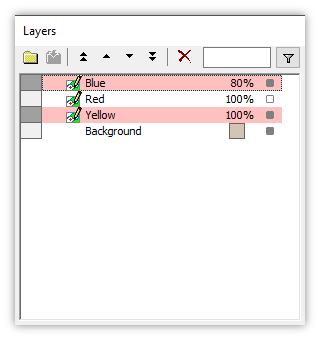 As with other layers, we can completely turn off the background color layer by double-clicking the Background layer. When the background color is turned off the window displays a checkerboard pattern to indicate there is no background color, just full transparency. Many graphics packages, for example, Adobe products like PhotoShop or the CS series, use a similar checkerboard pattern. The map contains three layers we haven't used. These show example results in the Transform: Overlay Topology topic, but we do not use them here so we will delete all three. We Ctrl-click on each of the three layers to select them all, and then we press the Delete button. 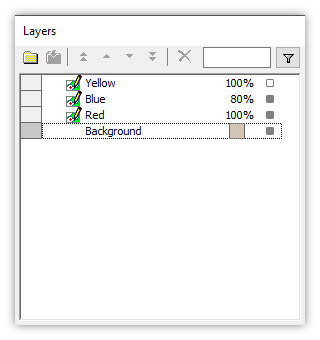 That deletes all three selected layers. Deleting a layer from a map simply means removing the use of it as a layer in a map. It does not delete those components from the project. We have also turned the background back on. 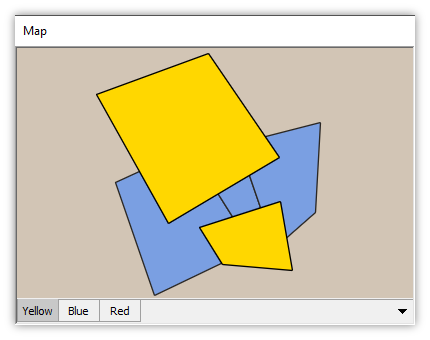 The map shows a simpler display with only the remaining three layers appearing as tabs. 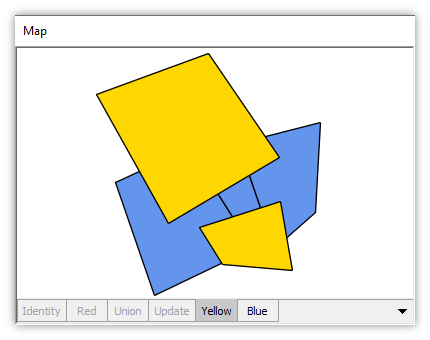 We turn the Yellow layer back on by double-clicking it. 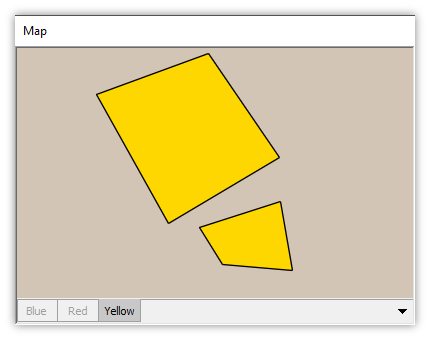 The Yellow layer immediately appears in the map. 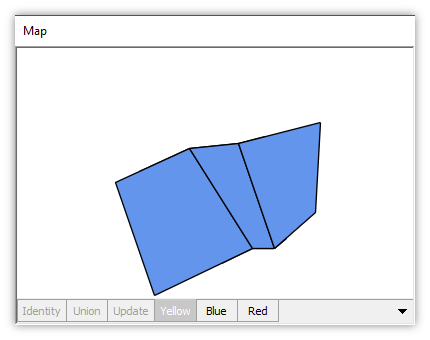 We will now demonstrate how the other toolbar controls also apply to all selected layers. We select the Blue and the Red layers by Ctrl-clicking each in turn. We now click the Move to Top button. That moves both of the selected layers at the same time to the top of the display stack. The display we see now shows the Blue layer on top with the Red layer next underneath as partially seen through the partially transparent Blue layer. The Yellow layer is on the bottom but since it is completely overlapped by the Red layer it is not seen through the Blue layer. 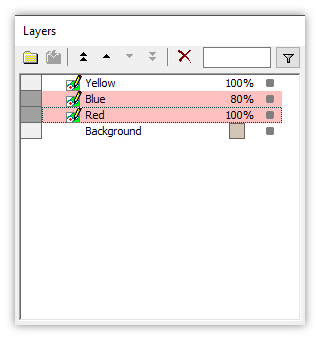 We can show more of the Yellow layer by turning off the upper layers. Double-clicking on either the Blue layer or the Red layer will turn both of them off. 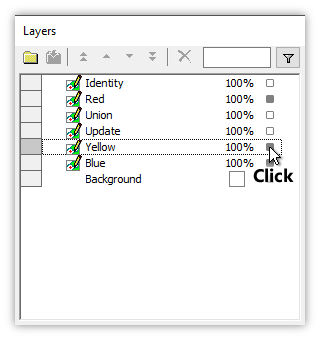 Actions like double-clicking to turn a layer on or off will apply to all of the selected layers. This is a very convenient way to turn many layers on or off at the same time. The Blue and the Red layer disappear. 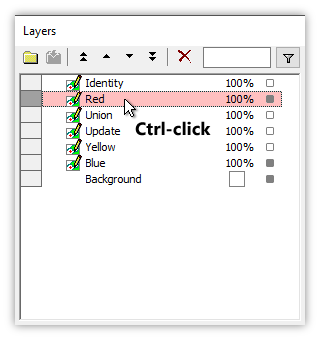 We now Ctrl-click the Red layer to deselect it. 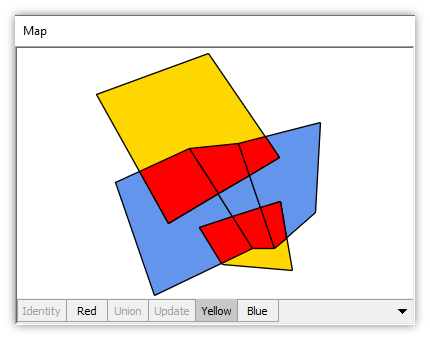 and Ctrl-click the Yellow layer to select it. We turn both the Blue layer and the Yellow layer on. With 80% opacity in the upper Blue layer the Yellow layer is partially visible underneath. 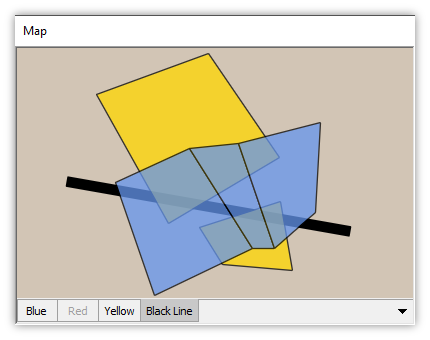 We drag and drop another drawing, called Black Line, into the map as the lowest layer. The new drawing contains a single thick black line. 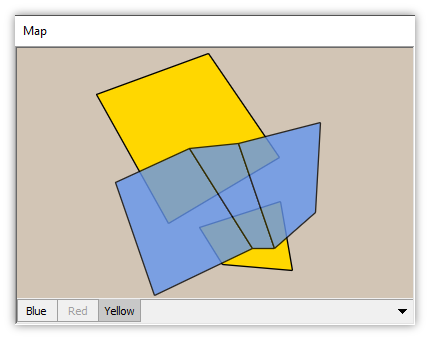 This shows how areas in the Blue layer are partially transparent but areas in the Yellow layer are fully opaque. We now double-click into the opacity setting for the Blue layer and change opacity to 75. This changes opacity to 75% for all selected layers. 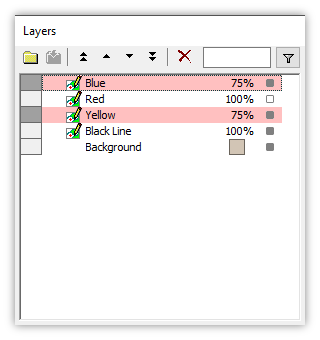 By selecting more than one layer we can change opacity for multiple layers at once. The black line is now partially visible through both the Blue and Yellow layer areas. 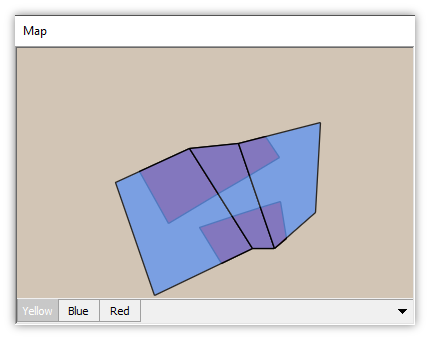 Examples from other topics - The Red layer in this example shows the result of the Overlay Topology, Intersect operation. Other layers use the same example data used in the Transform: Overlay Topology topic. Manifold Future - Future Tour Part 1 - This video shows how to download and use a portable installation for Manifold Future. The video also shows the Contents, pane, layers and layer opacity, one click use of data source favorites, using your own archival favorite and getting record values instantly. If you are using Viewer or Radian Studio, download and use the Future version to get access to all these powerful new features.